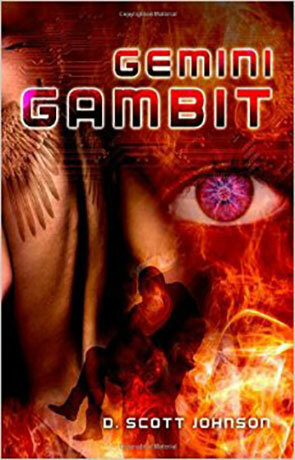 A title that gives a hint as to what we might expect, but ruins no surprises at all, Gemini Gambit by D. Scott Johnson is an intriguing story of the near future, immerses us in a world a generation or two further on from our own. Elite hacker ‘Angel Rage’ – whose real name is Kim Trayne has retired, but when Mike Sellars tracks her down in the middle of the Warhawk FPS World Tournament, curiosity gets the better of her. Who was this strange guy who managed to spring all her defences in the middle of a Squad PvP head to head? There is a clear echo of William Gibson’s Neuromancer in the writing, the deliberate choice to immerse the reader in extemporised colloquialisms and language that references both today and tomorrow. Familiar brand names parade past as nouns and verbs amidst the new paradigms of linked VR space and reality. We’re embroiled in a story of hackers, cybercriminals, A.I.’s and cybercops, but not so embroiled as to lose track of the real world that anchors them. At its heart, this is a traditional cops and robbers story. The technological trappings of this near future remain tangible. Cars, internet, and more remain familiar, but enhanced with auto-drive, full avatar manifestation and phone connection gateways. This is a world we recognise, but don’t yet inhabit. Johnson has targeted the next generation with careful precision, developing plausible enhancements and upgrades to what already exists. The writing moves at pace as we flip between our fugitives and their various pursuers. There is never a moment when you feel it slows too much or the exposition becomes unnecessary. Our main characters have clearly differentiated identities and purpose in the narrative as well. Johnson makes excellent use of believable locations and scenarios to connect us with each. The teenager Spencer is used particularly effectively as to fill in the legend of ‘Angel Rage’. The scenes with the pursuing FBI are also good barometer of how close to capture our fugitives are. The layers of avatars and virtual reality blur the online and offline spaces we are used to. Many of our characters are more comfortable in the virtual realm and Johnson uses the different dimensions to explore flaws along with coping mechanisms. At times our fleeing protagonists do make some errors that make you wonder at their competence, but perhaps this owing to the way the narrative hands off between viewpoints as you start to recognise what will be picked up by the various hunters, although, which of Kim and Mike’s hunters will get which clue becomes more and more of an intriguing puzzle. The continual use of pop cultural references projected forwards works in dialogue as well, as conversations quote the contemporary as if its old school. This is meticulously crafted stuff. Johnson also experiments with a specifically science fiction brand of writing the other, attempting to capture the mind of a personality in reverse to our own. In some ways, the ideas are similar to the film Her, although the exploration takes part alongside the aforementioned fugitive/hacker plot. Nevertheless, the perspective still makes us reflect on what it is to be human and many of the things we take for granted. Available at a bargain ebook price, this truly is a found pearl amidst the seaweed and clams. Written on 20th May 2015 by Allen Stroud.